Orange season was getting away from me. Florida and California varieties usually arrive around the second week of November and keep coming through late spring. They’re not great at the extreme ends of the season. February, March and April are the peak months. Late in the season they are likely to be dry, puffy and expensive. Oranges are not a summer fruit. My grandparents and great-grandparents knew what it was like to go three seasons without an orange. And my hunch is that they knew very well the first November oranges weren’t the best and that’s why oranges stuffed in December’s Christmas stockings were considered a wonderful treat. By the time the tradition made it to my generation, my cousins and I didn’t understand it and we didn’t see the sense in using an apple and an orange to take up valuable chocolate space in the stocking. Now knowing that oranges in the winter are the watermelon of summer, things seem very different. Imagine if we weren’t able to go to the grocery store any time of the year whenever we chose to buy oranges and fresh (real) orange juice. Oranges would definitely feel like an exciting gift in December. With prices the lowest of the season, at the time when they are the best-tasting, it was time to buy in bulk even if they were perishable. The WWII answer to perishable bulk was to preserve. Orange Marmalade. Not my favorite, but one of the only peanut butter combinations my husband will eat. 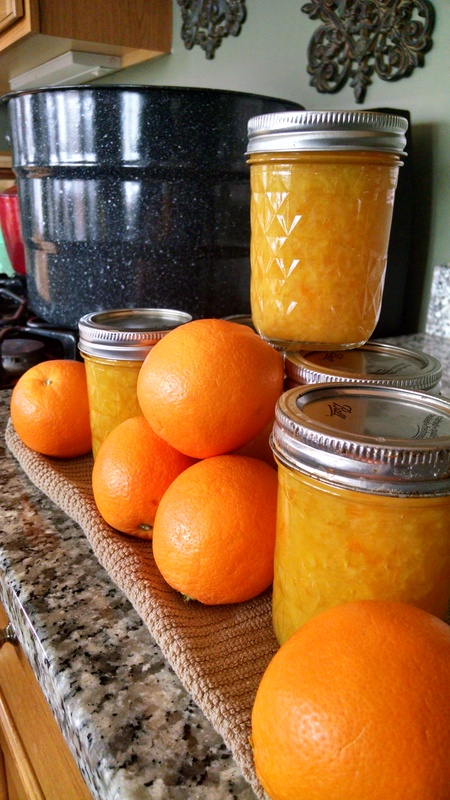 An orange marmalade takes 10 medium-sized oranges, 2 large lemons, water and sugar. Here’s the recipe instructions: Wash the fruit thoroughly; cut in quarters, then in very thin slices, discarding all membrane and saving all pulp, rind and juice. Cover with cold water in a heavy kettle; let stand overnight. Cook in the same water until the peel is tender; let stand for 5 to 6 hours. Weigh the whole batch and add an equal weight of sugar. Cook until the sirup gives the jelly test. Stir frequently to prevent scorching. Pour immediately into hot sterilized jars and seal at once. The Jelly Test: As the juice-sugar mixture nears the jellying point test frequently. Dip a spoon into the boiling mass, remove and allow the juice to drip from the side of the spoon. As it nears the jelly stage it will drip from the spoon in two drops ¼ to ½ inch apart; when the jellying point has been reached the two drops will run together and drop off in one sheet or flake. 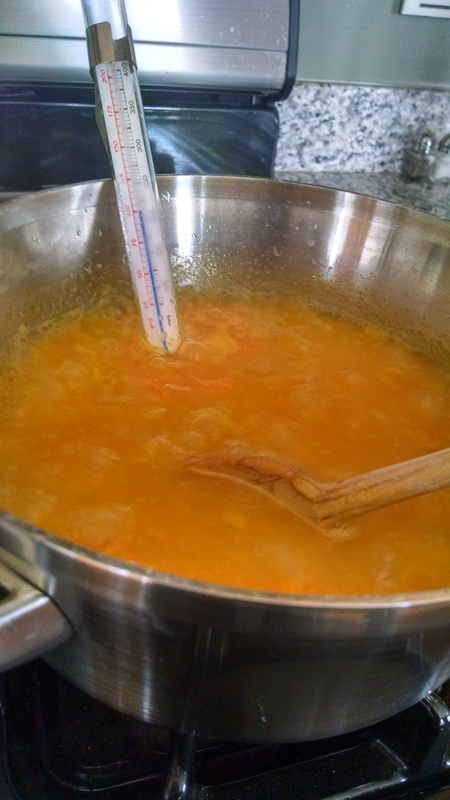 A candy or jelly thermometer may be used instead of the jelly test to determine the jelly stage. At sea level the jellying point is reached at 220° F to 222° F; at higher altitudes it is reached at a lower temperature. The 1942 cookbook goes on to describe the next steps of filling and sealing the glasses: Skim the surface of the jelly and pour immediately into hot sterilized jelly glasses, holding the pot close to the glass while pouring to avoid incorporating air bubbles. Fill the glasses to within 1/8 inch of the top; the jelly shrinks as it cools. Pour a thin layer of melted paraffin immediately over the surface of the jelly. Allow the jelly to cool thoroughly, then cover the glasses and store in a cool place. I used the thermometer method. Actually, I tried both, but the jelly test method left too much room for error. It’s one of those things I feel need to be shown, not read about, to fully understand. 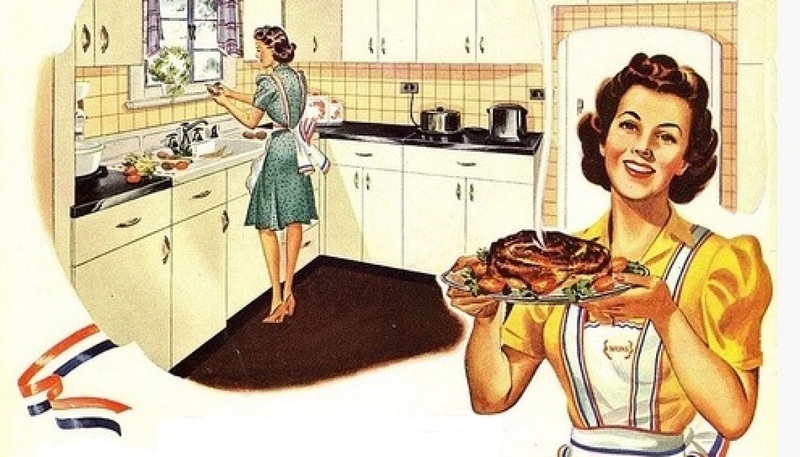 The next easiest thing would be to YouTube the jelly test method and watch/listen to a stranger through my computer explain it – I think I’d much rather find someone who learned from their mother or grandmother to show me. All told, for a very short amount of time and for roughly 23¢ a jar (uh-huh! ), I will likely not buy marmalade from the store ever again.